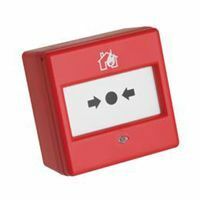 The Fulleon Call Point range is a selection of great value yet high performance call points for use on fire alarms within commercial and industrial buildings. The Fulleon Call Point is capable of working within an operating voltage of 9 – 30V DC and has selectable internal resistances of 470 & 680 Ohm. The 470 Ohm setting is for use on most modern conventional fire alarm systems, whereas the 680 Ohm setting will allow the break glass to be retro-fitted onto older fire systems using the 680Ohm value. The Fulleon Call Point comes supplied with a surface backbox, and both a glass and plastic resettable element. In addition to the standard break glass we also have the Fulleon Weatherproof Call Point available. If you’re interested in our Fulleon Call Point range you may also be interested in our Fulleon Roshni Sounder selection.